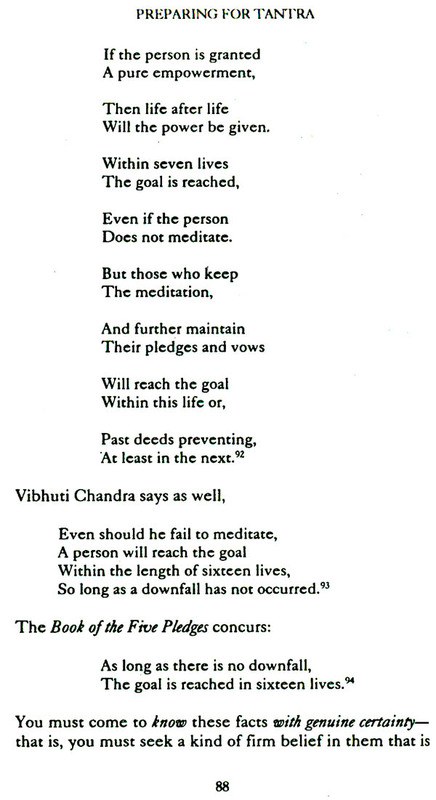 written by the greatest master of ancient Middle Asia. day will flower, and you will understand all"
The Tibetan Buddhist master Tsongkapa was born over six centuries ago. He was perhaps the greatest commentator of Buddhism in history, and wrote more than 10,000 pages in explanation of the ancient books of Buddhist wisdom. His most famous master piece of the Great Book on the step of the path, the Lamrim Chenmo, a clear and detailed roadmap to Enlightenment. He wrote the work after coming in and out of prophetic vision over the length of an entire month, at the great monastery of Radreng, in south Tibet. The vision was triggered by the Mountain of Blessings, a prayer and guide to perfection used by Lamas ever since, as a preparation for the secret teachings of Buddhism. 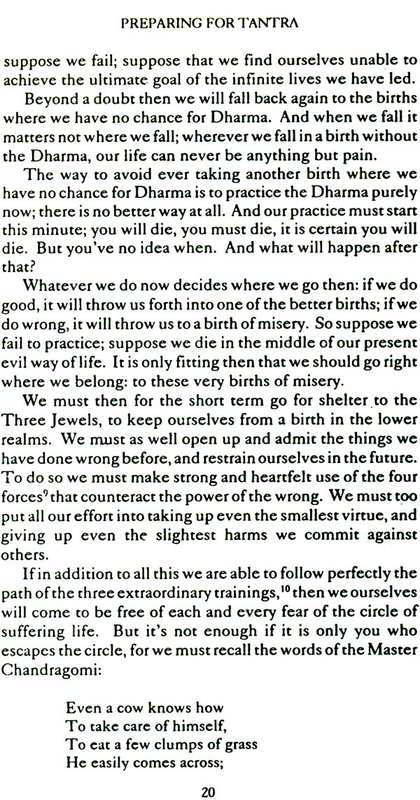 This important work appears here in full with a commentary by the illustrious Pabongka Rinpoche (1878 - 1941), generally regarded as the foremost Tibetan Buddhist teacher of the last century. 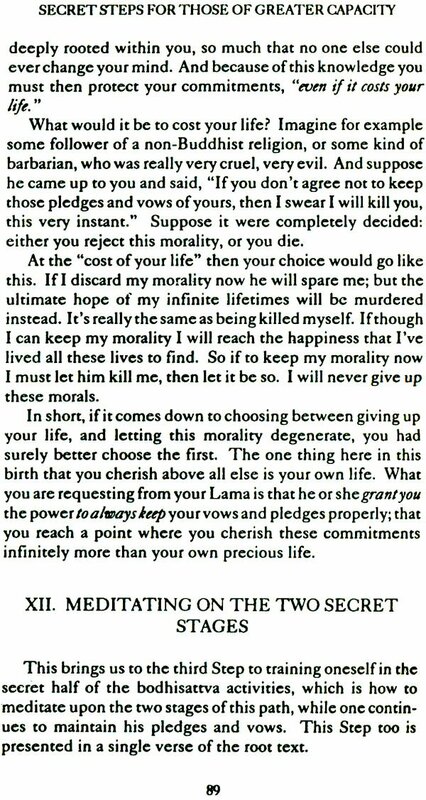 Both texts have been translated by Khen Rinpoche, Geshe Lobsang Tharchinone - one of the last great master of old Tibet, and a former abbot of Sera Mey Tibetan Monastery, one of the largest Buddhist monasteries in the world. "The Woman who Leads you to Liberation". possible. I want to reach it in this very life. Take a moment now before you go on. Make sure you have this motivation. This little book covers absolutely everything that the Buddha ever taught. 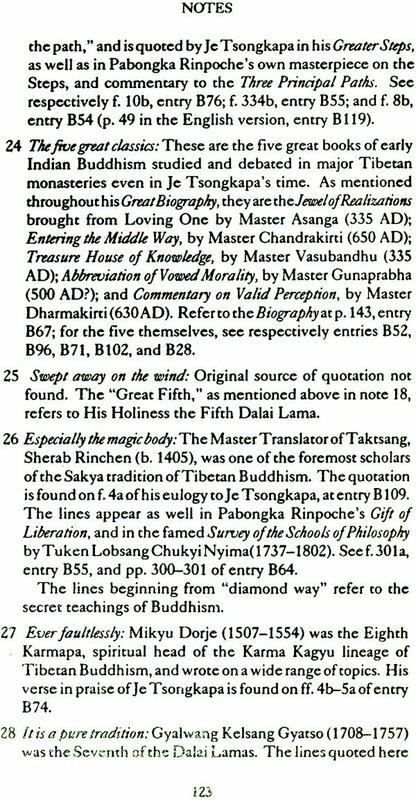 In Tibet we have a hundred great volumes of the Buddhas' own teachings, translated into Tibetan from Sanskrit, the language of ancient India. And this small book covers all of them. 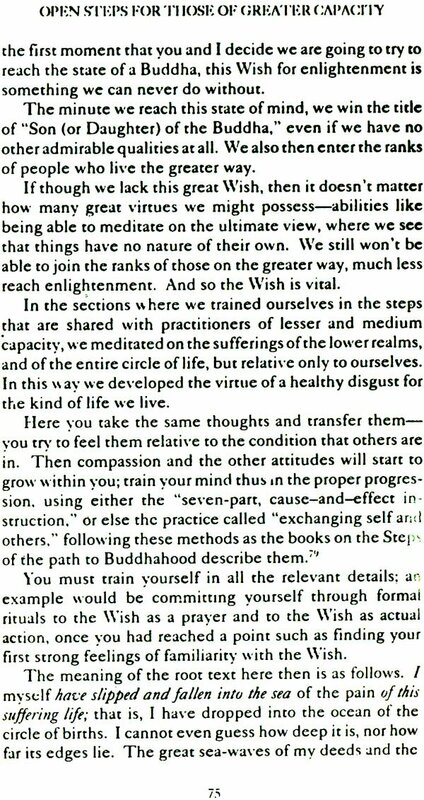 All the old, great books of Buddhism have but one main goal, and that is to show how anyone of us can reach the state of perfect enlightenment. They tell us everything we have to do: how to reach the goal, how to practice, and how to learn. They show us how to begin, they show us how to finish. Everything we need is in those books. Five hundred years ago in Tibet there came a master monk and teacher, whose name was Tsongkapa the Great. He took these ancient volumes and arranged them into a kind of book known as the Lam Rim, which means "Steps of the Path to Enlightenment." 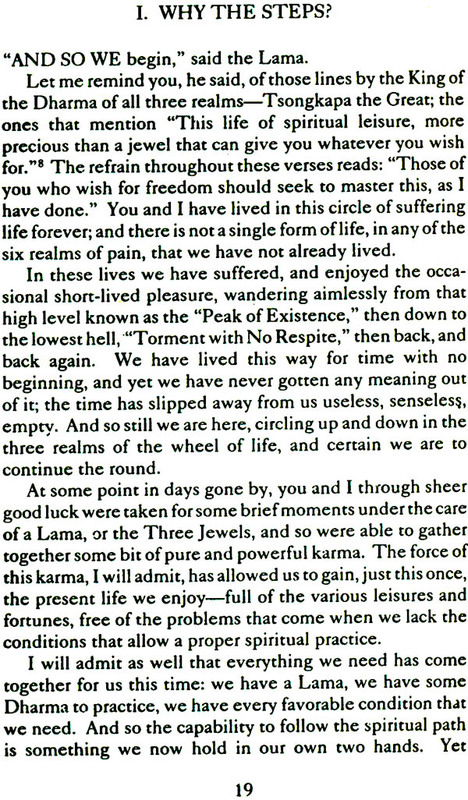 Here he laid out all the steps that any of us can go through, one by one in the proper order, if we truly wish to reach enlightenment. He took care to present the steps clearly and simply, yet covering every- thing that must be done, .as we start on the path, and travel along it, and finally reach its end. The small book here is called the Source of All My Good. It is the absolute essence of all the Lam Rims, of all the books on the Steps to enlightenment. The text was written by Tsongkapa himself, and it is named from the opening lines, which read: "The source of all my good is my kind Lama, my Lord." 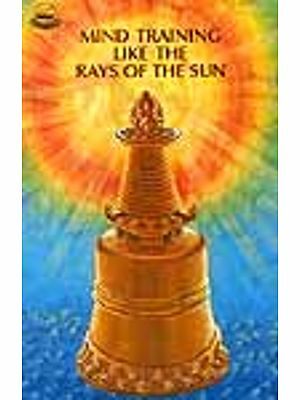 In the teachings on the Steps this work is also known by another name, something of a secret name, which is Begging for a Mountain of Blessings, The word "blessing" here refers to the blessings of all the Buddhas of the universe. "Moun- tain" comes from a Tibetan word which means a huge pile, a great mass of things all heaped together in one place. The word "begging" is meant to show how much we need and want these blessings. 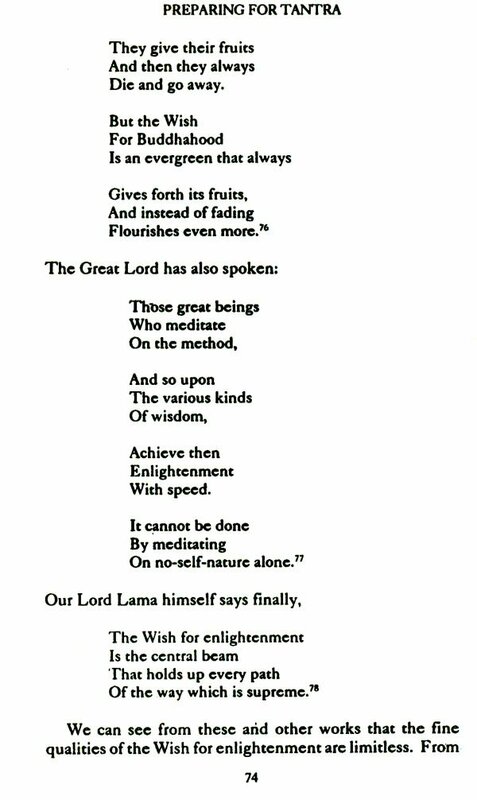 When we recite this work out loud, then, it's as though we are begging the Buddhas to grant us their blessings, to help us achieve everything from the beginning up to final en- lightenment. We are asking them to help us reach all the various paths, all the different levels of knowledge; we are asking for the power of their blessings, we are begging them for help. Just whom are we asking for help? Normally when we perform the secret Ceremony of the Tenth," we begin with the Practice of Six," followed by the Thousand Angels." Just after that we start this Source of All My Good. Therefore we still have in front of us the same holy beings who were there during the Thousand Angels. Sitting in the center, in mid-air before us, is Tsongkapa. 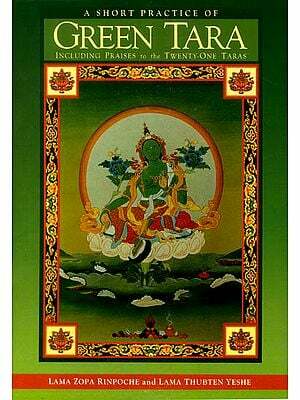 Inside his heart is Gentle Voice," or Manjushri, who is the image of all the Buddhas' wisdom. In the heart of Gentle Voice is another holy being, Vajradhara-rhis is the Keeper of the Diamond," or the Buddha of the secret teachings. His ,body is blue, and within his own heart is the Sanskrit letter huung. This letter is marked with another letter, mam. 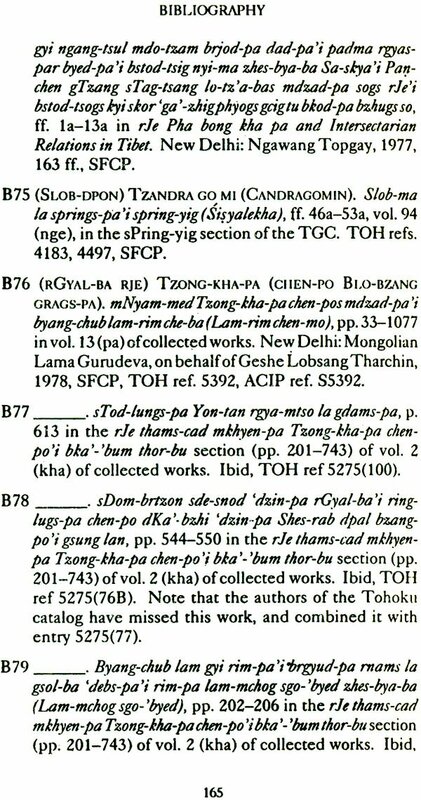 On Tsongkapa's own right is his disciple Gvaltsab Je, whose full name is Gyaltsab Darma Rinchen. Within this disciple's heart is Loving Eves, whose Sanskrit name is Avalokiteshvara, and who is the embodiment of all the Buddhas' love. Inside the heart of Loving Eyes is again the Keeper of the Diamond, and in his heart the letter huung, marked with a mam. 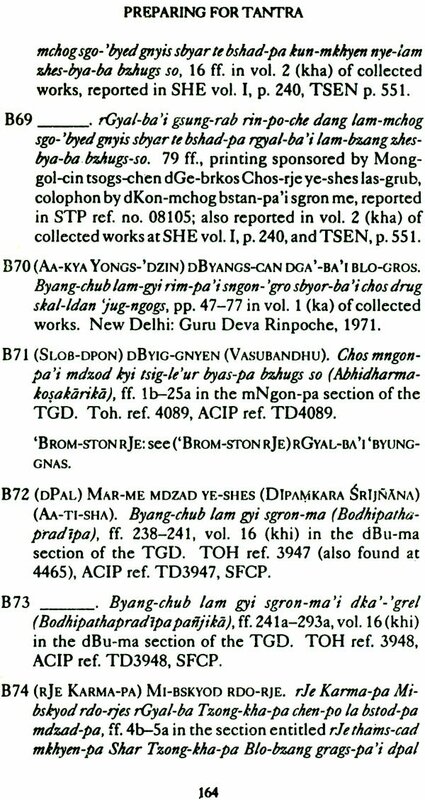 On the other side, to Tsongkapa's left, is his disciple Kedrup je, whose full name is Kedrup je Gelek Pelsang. Inside of his heart is the Holder of the Diamond. or Vajrapani, and in the Holder's heart is the Keeper of the Diamond. Within the Keeper's heart is a letter huung, marked with a mam. All of these beings are seated in the air in front of you. and they are the ones whom you are asking for their blessing. They are the ones that you are requesting to help you. to grant you every kind of knowledge, from the beginning of the path on up to final enlightenment. Now I want you to think about something. What is the difference between a Buddha and us? What is it that makes all the Buddhas different from us? And what about you, yourself? You are trying to reach Buddhahood; but what is the difference between all these Buddhas and you? This is a question you must exarni ne, and then the answer will come to you. What are the Buddhas? First of all. the places where they live are paradise. Pure paradise. The paradises where the Buddhas live are completely pure, they are pure by their very nature, and there is not a single thing about them which is not pure.